After the death of his parents, Jameson Cooper assumes he will take over his father's printing shop. Instead, he is thrown out on the streets of Charles Towne (Carolina Territory) and sentenced to life as an indentured servant to the baker for a false charge of stealing bread. His first day on the job he ends up as a victim of a kidnapping in which he is knocked out. When he regains consciousness, he finds himself aboard the Destiny under the direction of Captain "Attack Jack" Edwards. Somehow, Jameson manages to get on the captain's good side which seems surprising considering a series of missteps by him. The captain even gives him a special assignment based upon his map making skills. Disclosure: Review copy received from publisher at no charge. 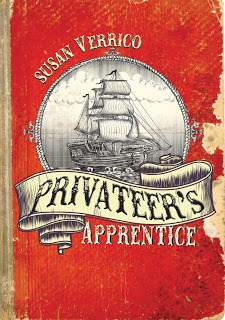 Winner will receive a copy of The Privateer's Apprentice by Susan Verrico. Please use the Rafflecopter form to enter. By entering, you acknowledge you have read the terms on the form and agree to them. Giveaway ends 5/8/2013 at 11:59 EST. we haven't started on Pirate books yet! My grandson had not read any pirate books that I know of or any historical fiction. All I have seen him lately reading is Harry Potter books. My youngest son loves the Captain No Beard books.